This post must be seen as a direct follow up to Arup Nandas Setting Up Oracle Connection Manager. There is a new needed connection: from the instance on dbhost1 to the connection manager on cmhost1. You see, the (SOURCE_ROUTE = YES) disappeared as well as the ADDRESS of the listener on dbhost1. Note, all the special parameters and settings on the clients TNSNAMES.ORA disappeared. But the cman must know about the SERVICE_NAME it has to serve. As the cman can be seen as a special kind of listener, there is a common way a listener gets informed about a SERVICE_NAME: the Instance has to register the services to the listener. In general this is done by pmon at registering to logal_listener and remote_listener. In this case, remote_listener is the magic parameter. You can follow step (1) to (9) as in Arups blog. 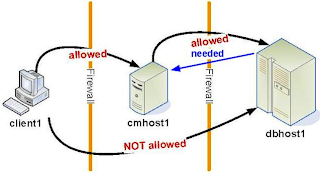 Proxy service "cmgw" has 1 instance(s). Service "INSTANCE1" has 1 instance(s). Service "cmon" has 1 instance(s). I try to create a dedicated service for all (or a well known set of) connections via the connection manager. By doing so it's sometimes easier to separate or identify different kinds of sessions.